Shannon Crawford, interior designer and writer of the blog Design Gal Her Handyman has some tips to help you put together your own inspirational wall display with plates! Do you have extra mix matched plates lying around? Do you have plates your kids have painted for you over the years? Displaying them on a wall is not only a fun idea, but can be changed out seasonally. - Beautiful plates can be found in your own cupboards, so don't forget to search out what you already own. You don't have to have expensive plates to show them off…look in dollar shops, thrift stores, yard sales and discount shops for pretty little plates that catch your eye and reflect your homes color schemes. 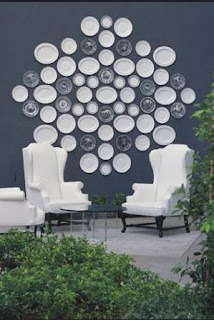 - Use plates to enhance the architecture in your rooms. Let them follow archways or create an arch over windows with a row of plates. Hang them over doorways to bring your eye up, or surprise with an unusual placement lower down on the wall. - Plates don't have to be confined to kitchen decorating. Use them over headboards in the bedroom, in a pretty guest bath, or gallery style along an empty hall. - Home improvement stores carry a wide variety of plate hangers that are easy on the wallet. - It's a good idea to make a preliminary sketching or pencil markings on the wall before you begin hanging. 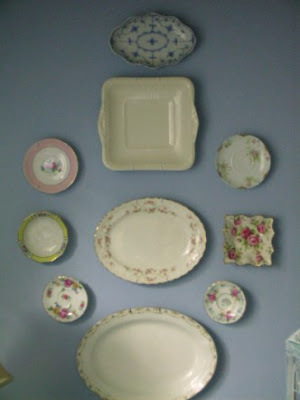 This will help you in getting the exact results you are looking for when decorating a wall with hanging plates. Step 1: Mask off the area you want to paint. Then prep the surface by lightly sanding it to help the chalkboard paint go on smoothly. Step 2: Apply two coats of paint (try Krylon Chalkboard Paint) using a small foam brush or roller, as the fibers in regular paintbrushes tend to leave behind streaks. Chalkboard paint comes in both liquid and spray versions. If you try the spray, be sure to cover the surrounding area carefully to prevent spatter. Step 3: When paint is fully dry, remove painters tape and write a fun message with chalk!